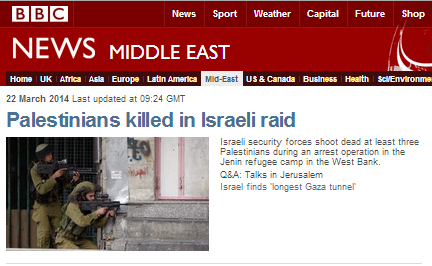 “Palestinians killed in Israeli raid” was the lead headline on the BBC News website’s Middle East page on the morning of March 22nd 2014. The sub-header also omitted any mention of what those Palestinians were doing when the incident which is the subject of the report took place. 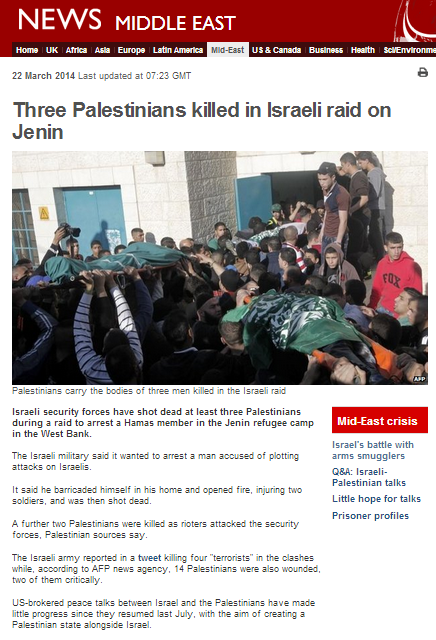 The link leads to a short 132 word report titled “Three Palestinians killed in Israeli raid on Jenin“. The article’s opening paragraph also ignores the actions of the Palestinian casualties. Readers have to proceed to the third paragraph (out of a total of six) in order to discover that the incident actually began when a wanted member of a terrorist organization opened fire on Israeli troops trying to arrest him. “The terror suspect, Hamas member Hamza Abu Aleija, planned to attack Israelis in the West Bank and Israel, according to suspicions. As Counter-Terrorism Unit members approached the house to make an arrest, shots were fired at them. The special forces stopped their approach, and the army used loudspeakers to call on all of the residents to evacuate the building. “Everyone left the home other than the suspect. We ensured there were no family members inside,” the source said. Meanwhile, Abu Aleija continued firing bursts of gunfire at security forces, and Palestinian gunmen from the area arrived at the scene, opening fire on the infantry soldiers who were securing the operation. The Counter-Terrorism Unit sent a dog into the home, and the animal was shot dead by Abu Aleija. According to the Times of Israel, Palestinian sources made the same claim. “Israeli military sources said the attempted arrest followed a months-long pursuit of the fugitive Al-Hija. The IDF surrounded his house Saturday morning after receiving precise intelligence on his location. Security establishment officials said he was planning terror operations against Israeli civilians and IDF soldiers in the West Bank. Military sources said Al-Hija received orders directly from Hamas leadership in Gaza. “A further two Palestinians were killed as rioters attacked the security forces, Palestinian sources say. Whilst the BBC places the word terrorists in scare quotes, it does not reveal to readers that at least two of the other men killed were members of other terrorist organisations. That information was confirmed by Palestinian sources, as well as by the terrorist organisations themselves. The description of the additional casualties as “rioters” who “attacked the security forces” does not make it sufficiently clear to audiences that the hundreds of attackers were armed with improvised explosive devices and firebombs. It also fails to clarify that at least some of the “14 Palestinians” also wounded in the incident were armed gunmen. The overall effect of this BBC report is to mislead audiences by failing to clarify the fact that all three of the men killed in the incident were members of terrorist organisations, by downplaying the actions of terrorists and armed rioters and by placing the focus of attention on the actions of IDF soldiers. That imbalanced and partial presentation is clearly not conducive to accurate audience understanding of the incident. Following the killings of three Palestinians in Jenin, Hamas urged the Palestinian Authority to halt all security cooperation with Israel. It’s bloodthirsty Israel vs sweet Hamas, Fatah and Islamic Jihad, members of which just want to do their peaceful best to slaughter others, particularly Israelis. With moderate peace partners like Fatah, Hamas and Islamic Jihad, how could the Obama – Kerry mandated Israeli – Palestinian “peace process” possibly go wrong? No , it’s not disgusting – it’s wrong in the former case, not the latter. It should ALWAYS read like “Pakistani killed in US raid in North Waziristan” – even when Israel does it too. This is not a race to the ‘sanitized’ bottom of Journalistic reporting – this is about reporting news. Seriously? So, if a US general was killed by a bomb in Afghanistan, you would expect a headline like: “American killed by IED in Kabul”? Rather than ‘downplays’ I would say ‘BBC DISTORTS’. Can we quit our halucinaddict habit of calling PalestineArabs Palestinians? That would be a first step to teach truth through impartiality and accuracy!